We had the best time on this little trail up Payson Canyon! The hike is short, but the trail is fun and perfect for your little adventurer. It was a blast crossing log bridges over the river and finding a beautiful waterfall in a cave-like area at the end of the trail. Grotto Falls has a little wading area at its base, so of course we had to dip our feet in the icy cold water. This trail is marked as the Grotto Trail along the Nebo Scenic Loop. The road itself is rather curvy and narrow, and you will enjoy beautiful views along the way. This trail is great for kids. You may need to help them along the log bridges if they are really small, but most kids will think it’s the coolest thing ever. I was surprised at how much fun I found the log bridges to be! Dogs are allowed on this trail. The hike was muddy for us and we played in the water at the end, so plan accordingly for the car ride home. This trail is 0.6 miles round trip. From Interstate 15 in Utah County, take exit 250 toward Payson Main Street. Turn left at 100 N, and then take a right onto 600 E (there will be brown signs pointing you to the Nebo Scenic Loop). Follow 600 E to the mouth of Payson Canyon. From the mouth of the canyon, follow the road for 6.6 miles until you reach the Grotto Trail on the left side of the road. 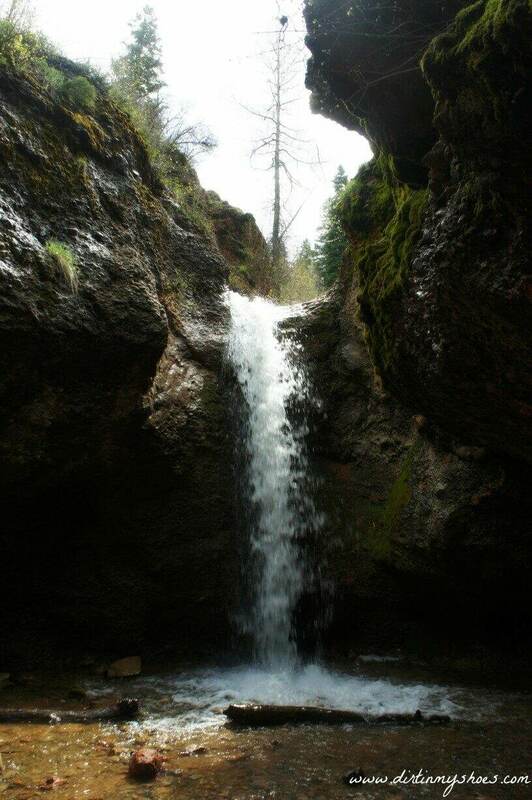 What is your favorite waterfall hike?